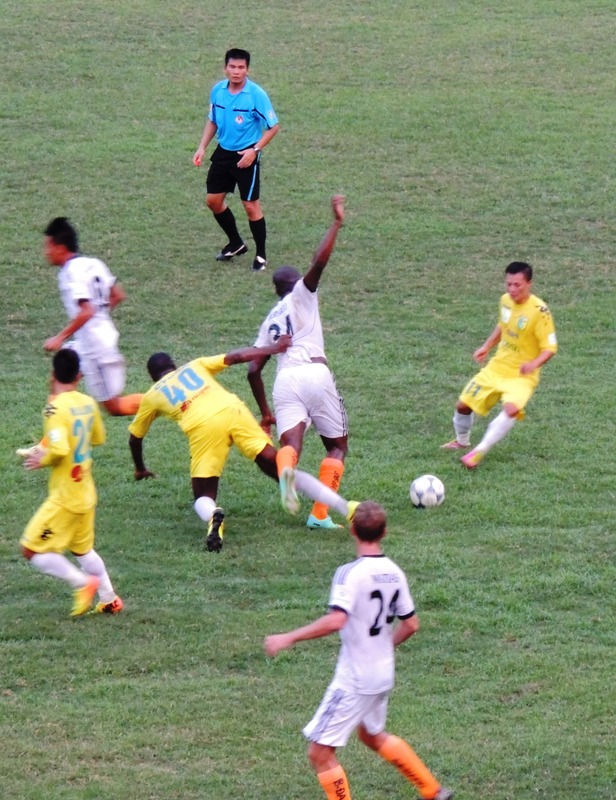 SHB Đà Nẵng were in town on Wednesday afternoon for a rearrange fixture against Ha Noi T&T. A fixture that could see T&T return to the top of the Vleague. A fixture between two entertaining teams with real quality. Certainly a fixture I’ve been looking forward to. On this occasion, I wasn’t. Two days prior to the game I’d been visited by my old nemesis; ‘Hanoi respiratory sickness’. I wasn’t going anywhere. That was until 4pm, when a team of 8 guys arrived outside the building I live in. They’d arrived to fix the drains on the roof, directly above my apartment. This was bad. My acute ear infection was not going to enjoy this. You see, for any type of maintenance work in Hanoi, it seems the obligatory tool kit must involve a pneumatic drill and a very big hammer. And on this occasion, rather bizarrely, 8 bags of cement. The noise was unbearable. I was going to the game after all. Ear plugs in, spare painkillers in pocket, I’d slip in and sit in the upper tier, avoiding contact with anyone and strategically placing myself as far away from the drums as possible. Fed up of traffic noise? 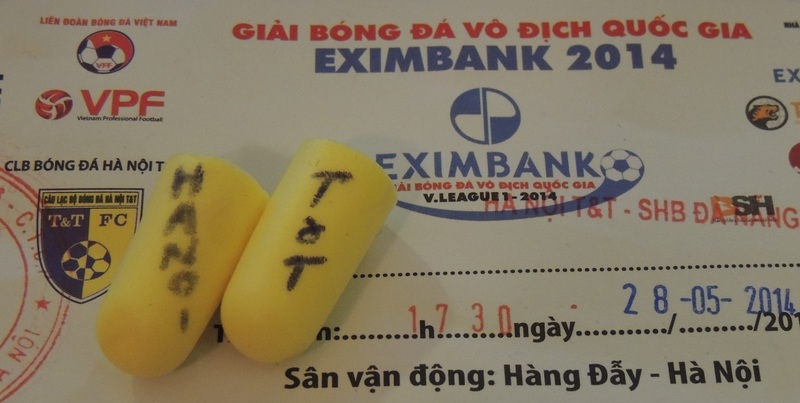 show your support for T&T with these fetching ‘limited edition’ earplugs. Ticket purchased, I popped into a café to kill some time and avoid the horrendous stadium sound system. Sod’s law would have it that people would choose today’s game to befriend me. Normally I love meeting new people, but not today. I was pouring with sweat, my eyes were swollen and my throat incredibly sore. Tung though, a rather nice guy that actually knows a lot about VN football, refused to allow me to slip off and insisted on purchasing my coffee. He’d managed to buy me for the afternoon. I felt cheap. The coffee was only a dollar. I met his friends. We sat in the upper tier and he even sent pictures of us together to his girlfriend, who happens to be an Arsenal fan. I was still sweating. So much so I’d begun to look like I’d had an accident. It was indeed an entertaining game, probably the highest quality from two teams I’d seen all season and it took a moment of real quality to break the deadlock. Gonzalo received the ball just outside the area and line up a thunderous left-foot drive past Van Hung in the Đà Nẵng goal. A brilliant strike from the Argentinean. At the other end, an intriguing battle was developing between T&T’s new centre-half, Cyrus, and the imposing Đà Nẵng striker Barnardo. Ultimately it was Hanoi’s new signing that came out on top, with a fine performance. Đà Nẵng certainly haven’t been the same since the prolific striker, Merlo, was forced to quit the club through injury. The month of May in Hanoi wouldn’t be the same without some rain. During half time the skies obliged with a light downpour. We retreated to the back of the stand. In the space of 20 minutes I’d experience overheating and sweating, damp from the rain, then a bit chilly, then heat again. I had a feeling this wasn’t the best choice I’d ever made. After the restart it took Ganzalo just seven minutes to double Ha Noi’s lead, with a neat finish from a Hong Tien cross. The game continued to entertain as T&T, unlike many Vleague teams, resisted the urge to waste time and continued to attack. Ngoc Duy coming closest, when he saw his effort come back off the bar. 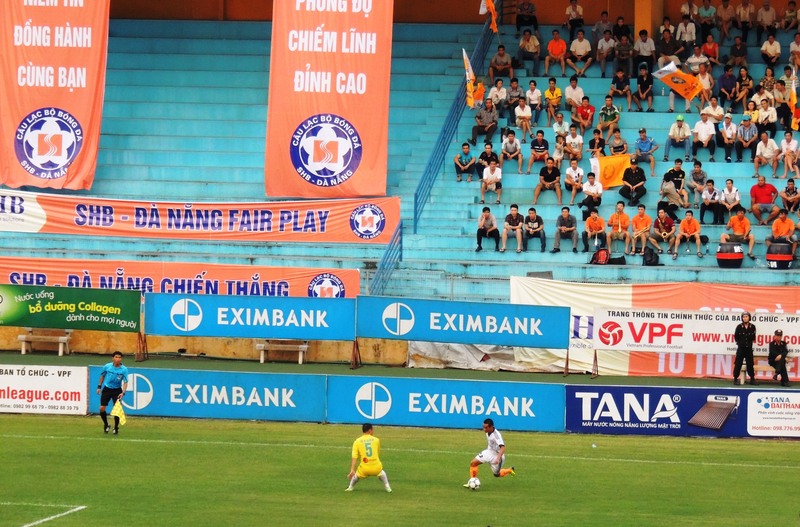 Đà Nẵng played their part to, continuously playing positive football. The game ended 2-0 and the win sent T&T back to the top of the league on goal difference ahead of Binh duong, but with another game in-hand still. Next up, more medicine and an away day in Hai Phong.